The folks at Lockitron have something really cool going on. They have only been at the smart lock game for a while, but they are already creating a splash when it comes to remotely controlling your deadbolts. Like the August Smart Lock, Lockitron works with your ­currently installed deadbolt. However, unlike the August Lock, Lockitron doesn’t replace the interior hardware: It fits over it. The Lockitron people have put tons of research and Q&A into the product, and it shows. Credit: Image courtesy of Lockitron.com. Lockitron will fit over most locks, which is good. But unlike August, Lockitron does communicate via Wi-Fi right out of the box. (Again, as of this writing, August promises this for the future.) This means that you can control your Lockitron from anywhere you have a smart device or a computer, which is huge. 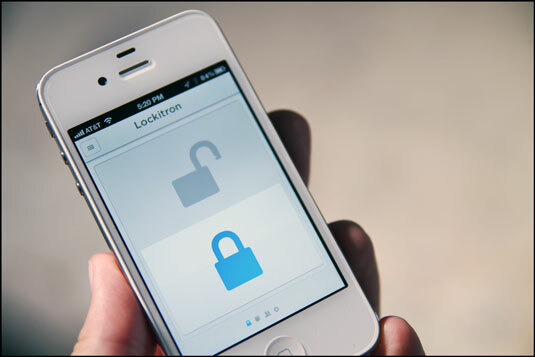 Download the Lockitron app for your iOS or Android smart device, create an account, and register your Lockitron. Insert the included batteries into the Lockitron. It will power on automatically. Follow the instructions in the Lockitron app to set up your Lockitron with your Wi-Fi. Loosen, don’t remove, the two screws on your deadbolt’s inner plate. Slide Lockitron’s C-plate behind the deadbolt’s plate. Tighten the two screws on your deadbolt’s plate to hold it and the C-plate in place. Place the main body of your Lockitron over the C-plate and line the notches up. Turn the main body clockwise until they lock, but be careful not to force it. Unlock your deadbolt and tell the Lockitron app on your smart device that it is unlocked. Slide the Lockitron rubber insert over the deadbolt’s knob and line it up with the inner notches of Lockitron’s main body. Line the knob on the Lockitron faceplate with the deadbolt’s knob and snap it into place. Done! All that’s left to do is give the whole thing a try using the Lockitron app. Share access to your home by having others download the Lockitron app and use the codes you give them. Lockitron can automatically lock and unlock doors, depending on your phone’s proximity to it. 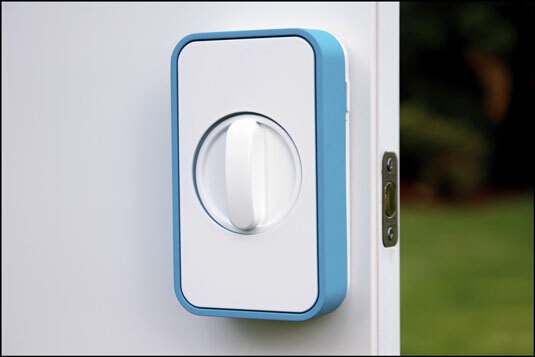 Lockitron will tell you when someone is knocking on your door. Receive notifications whenever anyone enters or leaves your home. For $5 a month, you can set up Lockitron to use SMS text messages to lock and unlock. This is for those in your circle of trusted individuals who don’t have a smart device on which to download the Lockitron app. Batteries can last up to six months before needing replacement. If they give up the ghost before you can replace them, don’t sweat it: Just use the knob on the inside of your home and use the key on the outside (don’t worry, it’s only temporary).